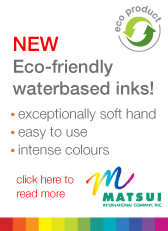 We offer a colour-matching service for both graphic and textile inks. Colours are matched to the specific Pantone colour required or alternately to a supplied sample. All colours matched are recorded and referenced, with a retained sample being used to ensure that future re-orders are re-matched to the exact colour every time. For more information contact us. 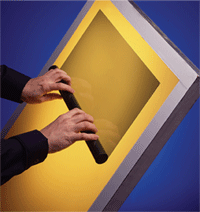 We offer an exposure service for new screens, as well as a cleaning, re-coat and exposure service for used screens. Our facilities allow for screens up to 2.0 X 1.4 meters in size to be exposed, using the correct CHROMALINE emulsions for both our textile and graphic customers. For further information and pricing contact us. At NSDS we offer a comprehensive and competitively priced screen re-meshing service. We are direct importers of the finest quality polyester screen mesh from NBC of Japan, and KIWOBOND adhesive from Germany. Our staff have many years experience, and use both manual and pneumatic equipment to ensure optimum results for both our Textile and Graphic clients. 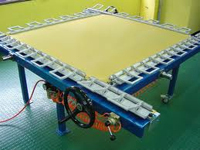 We have the capacity to stretch screens up to 6 meters in length, with orders having a turnaround time of 24 to 48 hours as a general rule. For more information or pricing, email us. We manufacture new frames to order, utilising either aluminium or mild steel. Our in house work shop ensures we offer you the best possible value in the shortest turn-around time. Standard frame sizes are kept as stock items, and are galvanised to ensure longevity. Other products such as custom designed speciality frames, stoppers for printing tables, stands for exposure units and much more are also available. For more information and pricing contact us. NSDS offers support in terms of telephonic assistance, on site analysis of customer needs where required, and testing of ink systems for adhesion and suitability. Staff with many years experience are on hand to offer you advice on issues such as which inks are best suited to a specific application, trouble shooting for problem areas, and anything else relating to the screen printing process. For further information please contact us.